Mobile devices and apps have the potential to dramatically accelerate a company’s business velocity but many organizations are still only enabling basic capabilities such as email and calendar. 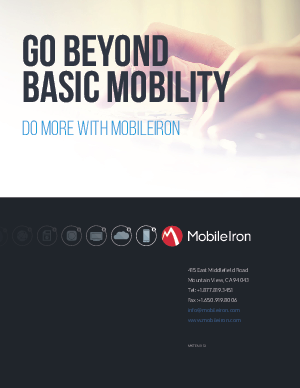 Now is the time to look at how MobileIron can help you do more across your mobile, cloud, and desktop infrastructures. Our comprehensive mobile and cloud security platform provides unified visibility and control across mobile devices, cloud services, and PC endpoints, which drastically reduces the complexity of managing these disparate infrastructures. That means you can focus on delivering more business value instead of reacting to security threats and fighting fires. MobileIron is the security backbone for the digital enterprise and we are continuously delivering the innovative technologies our customers need to transform their mobile business operations. We understand both the challenges and the threats and we keep you ahead of them. This white paper explains the many ways we help our customers protect their critical data on any device, network, or cloud service so you can focus on your business.